Internal film roller blinds offer very good heat and glare protection, guarantee a clear view and save energy. Super features - provided that the roller blinds are used optimally according to the respective weather conditions. 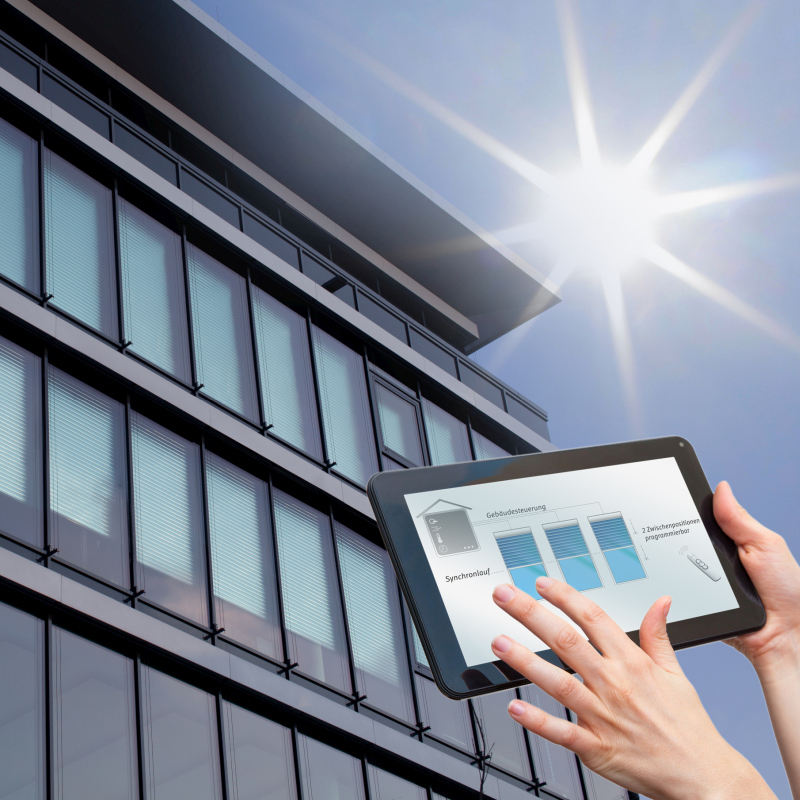 Reliable help is provided by the integration in building control systems. A wide modular system of different head boxes and profiles provides the right shading solution for almost every window or façade situation. Various roller variants for various installation positions and window shapes, XXL roller blinds, slanted and roof roller blinds, slat or panel curtains are available for new construction or for retrofitting. Of course, individual solutions for integration into the facade are also possible. Depending on the system, manual and electrical controls are available. Motor-driven systems (24V, including SMI, 230V, accumulator motor) can be integrated into all common building control systems, such as KNX, LON or Smart-Home. Many tests, simulations and examinations prove the special heat and thermal insulation protection of film roller blinds. Due to the highly reflective film, the total energy input through the glazing can be reduced to 10%. In winter, the blinds improve the insulation of the windows and reduce heat loss. Even with optimal glare protection, the transparent blinds allow daylight into the room, which saves additional artificial lighting. All in all, it can save up to 37% energy compared to a window without sun protection over the year. These energy-saving effects are clearly illustrated by the ift Rosenheim energy label. The Institute of Window Technology uses the commen label design known from electrical appliances. The conflicting situations of cooling energy demand (summer heat protection) and heating energy demand (winter heat insulation) are considered separately. 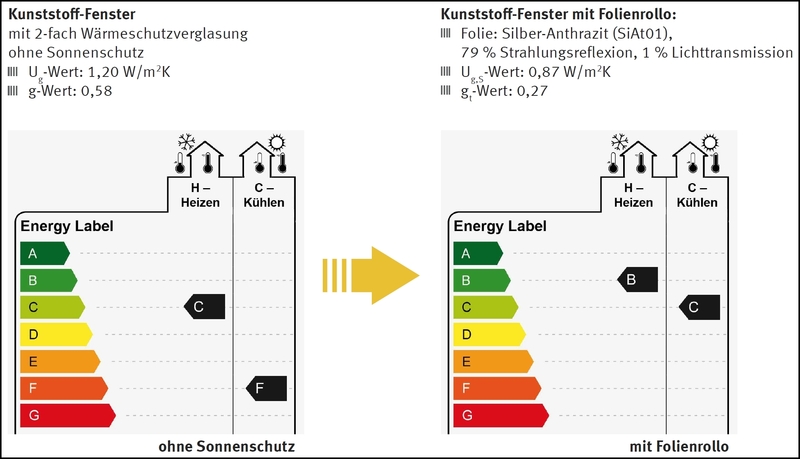 The comparison of the energy labels for windows with and without solar protection shows the improvement of the energy efficiency classes for cooling and heating energy and thus offers a very good decision-making aid. However, to fully exploit these energy saving effects, adequate operation according to the weather and season is required. The blinds should be closed in the summer with the first rays of sunlight and opened at night to protect the rooms optimally from heat. In winter - if the sun does not dazzle - open roller blinds use the solar energy inputs during the day. Again closed roller blinds prevent the loss of heat through the windows in cool nights. Always following these recommendations requires special attention and consistency. 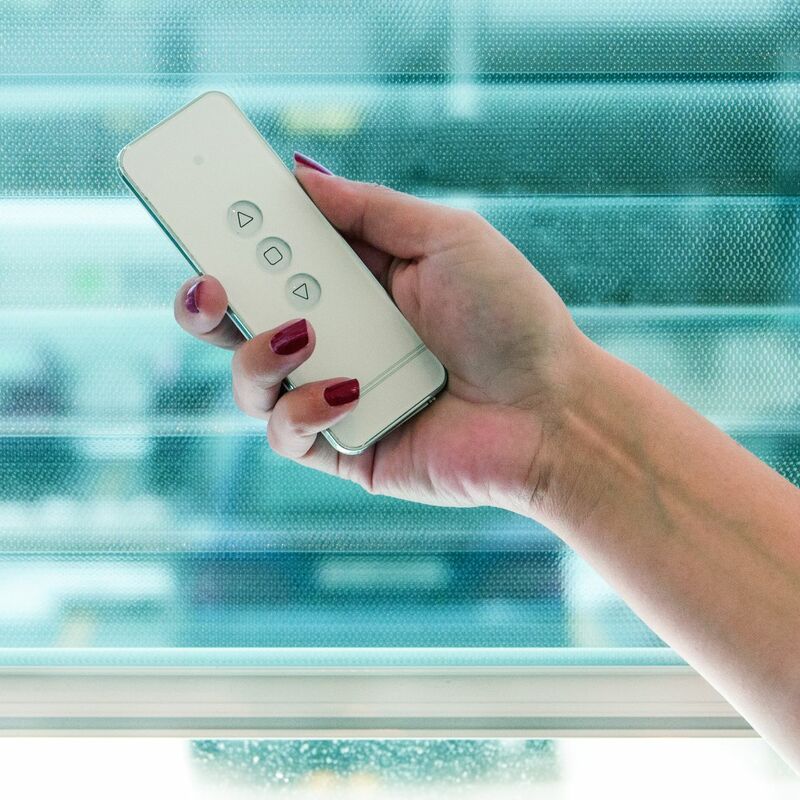 Automatic controls offer convenient solutions here: The electrically operated roller blinds from MULTIFILM® can be integrated into all common building control systems such as KNX, LON or Smart Home systems. The operation and control of the systems is now simply by mouse click on the PC or via App on the tablet or smartphone. In order to optimize the opening and closing of the plants energetically, solar sensors can be integrated into the control or storage algorithms according to the seasons. On wind guard can be dispensed with altogether, since the film blinds are mounted inside and always provide weather-independent reliable sun and glare protection. Further advantages of mounted film roller blinds are lower acquisition costs, no maintenance costs, easy retrofitting and free facade design.